PHOENIX--(BUSINESS WIRE)--Avnet (Nasdaq: AVT), a leading global technology solutions provider, today announced the release of SimplePlus Display Solutions globally. SimplePlus is a unique platform that simplifies the process of customizing LCD touch display solutions for applications spanning markets which include industrial automation, medical, transportation, and more. No matter the application, SimplePlus provides the ability to meet user experience requirements without placing time to market and budget at risk. SimplePlus is proven to significantly shorten product development cycles by delivering customers their first working unit within 48 hours, instead of the typical weeks or months for traditional samples. As a result, product designers and engineers can reduce the total development time significantly. SimplePlus is a custom touch display platform, leveraging Avnet’s know-how and experience earned designing thousands of display solutions over decades. Avnet cuts delivery time in half, while giving customers the power to customize their user experience. SimplePlus is a complete solution which includes the LCD module, touch, custom cover lens with different surface treatment and bonding options. In addition, Avnet provides different mechanical design and integration options such as gaskets, plastic and metal frames. Testing and regulatory guidance further helps to deliver a trusted solution to market on-time. Because SimplePlus is configurable, the platform can be adapted to meet the specific needs of any customer, regardless of the industry. For example, a medical device company trying to develop a custom display that meets both user experience and industry requirements can leverage the SimplePlus platform to more quickly bring a new product to market. Or, if an industrial equipment manufacturer needed to protect their touch screen display solution from precipitation, dust and sunlight glare, SimplePlus would allow them to work with Avnet to develop the custom solution required by their deployment environment. SimplePlus is just one of the mays ways Avnet Integrated helps customers get their products to market efficiently. Avnet Integrated delivers embedded, display and data center solutions from end-to-end or anywhere in between. With unparalleled capability, technology expertise, and global reach, everything we do is focused on allowing our customers to do what they do best. Simply put, you innovate, we’ll integrate. Visit Avnet.com today to learn more or visit SimplePlus at: http://avnet.me/SimplePlus. 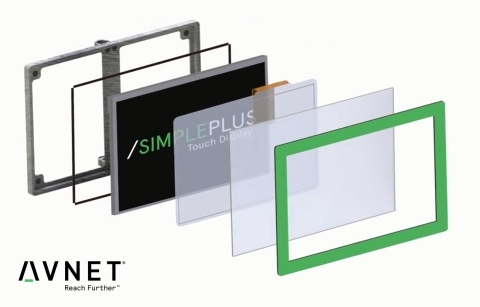 Avnet's SimplePlus is a unique platform that simplifies the process of customizing LCD touch display solutions for applications spanning many markets.